While I was driving through the town of Manchester, Vermont last summer, a quaint house sporting a salmon weather vane and a hand-carved fish over the doorway caught my eye. Taking the bait, I stopped and stumbled across the American Museum of Fly-Fishing. I expected to stay for a few minutes, but I browsed for hours, drawn into the mesmerizing world of fly-fishing. 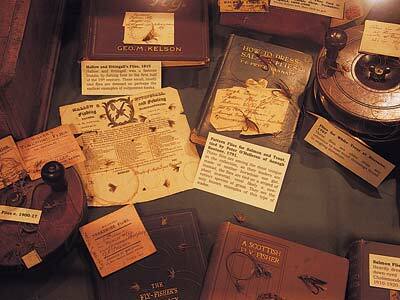 Displays include the world's oldest documented flies, dated by a bill of sale from 1797; a large collection of flies tied by famous masters of this intricate art; and fishing tackle once owned by Ernest Hemingway. The museum also features books, art, manuscripts and photographs chronicling the sport's rich history, which dates back to the 16th century. At one exhibit, I pushed a button and watched in fascination as a line braider created the Dacron core of fly-fishing line. Another exhibit showed how reels and rods have evolved over the years. Anyone who's ever enjoyed a quiet afternoon of fishing will find this museum a rewarding stop. Manchester is on State Highway 7A, about 20 miles north of Bennington (featured on page 62 of the March/April issue). The museum is open daily from 10 a.m. to 4 p.m. (except on major holidays). Admission is $5 for adults and $3 for children ages 5-12. For more information phone 1-802-362-3300.